The simple idea that past choices limit our present and future choices is often referred to as “path dependence” in the economics literature. In brief, path dependence explains how one’s choice set (in the case of vampires, raid or trade) is limited by the decisions one has made in the past. Here, I extend the concept of path dependence to embrace culture or cultural customs — what I shall refer to as “cultural path dependence.” In other words, even if “trading” (buying blood) is theoretically better than hunting or “raiding” (taking blood by force), there might nevertheless be large social and psychological “switching costs” in moving from raiding to trading. Simply put, raiding or hunting for blood might be so deeply entrenched in the vampire world that bargaining and trading for blood are mentally ruled out as a realistic option, or in the words of one commentator, “taking blood by force may be so culturally ingrained among vampires that … there is cultural barrier against [trade].” In other words, given so many centuries of predatory habits and customs, vampires might by now be culturally disposed to raiding or culturally resistant to trading. Again, the problem of cultural path dependence poses a non-trivial objection. It requires us to explore the complex relation between markets and culture. After all, markets do not arise in a vacuum or out of thin air. Markets are embedded in specific cultures and ways of life; so markets are unlikely to arise in a culture (say, vampire culture) that prefers raiding to trading or in a culture that prefers gift-giving to buying and selling. Okay, fine, I get that. But don’t markets, in turn, shape culture? Put another way, is the relationship between markets and culture a symbiotic one? A one-way or a two-way street? My conjecture is that markets and culture exert a reciprocal or symbiotic influence on each other. To be sure, culture (human or vampire) shapes what things can and should be gifted or traded and whether raiding is preferred to trading, or vice-versa. But the activity of trading — or the propensity to “truck, barter, and exchange” — also occurs in most human cultures, a fundamental insight that goes back to the work of Adam Smith, if not earlier to Aristotle. 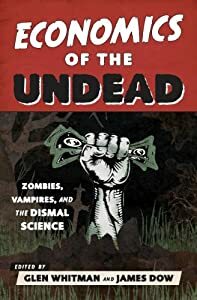 …but let us assume that vampires are, in fact, culturally or socially resistant to trading due to cultural path dependence, that vampires prefer raiding to trading. Is there any realistic possibility of moving from a raiding equilibrium to a trading equilibrium given the vampire preference and cultural disposition for raiding? We will never know unless we try, but my conjecture is yes. By legalizing trade in blood — specifically, by respecting our property rights in blood and by enforcing human-vampire contracts for the purchase and sale of blood — law can play a decisive role in changing the cultural equilibrium from raiding to trading. By the same token, without clear legal rules and enforcement mechanisms — without a legal structure — the problem of cultural path dependence will no doubt prevent many mutually beneficial trades from happening in the first place. This entry was posted on Friday, January 2nd, 2015 at 6:53 pm	and posted in Uncategorized. You can follow any responses to this entry through the RSS 2.0 feed. Speaking of trust and culture between vampires and humans, one question we must ask ourselves is what legal standards do each side abide by? If vampires ignore certain legal standards, that would specifically affect a trade market, this would certainly throw the scales between a transaction. While I do agree that markets have the potential to shape culture, I do not believe that this is a change that can be made overnight. In the long run the idea of vampires evolving and sharing our mindset to “trade” rather than “raid” may be attainable. However, this won’t be an immediate change. Before we can take any steps forward in the endeavor to create a blood market, we must first ensure that vampires will abide by the legal standards we set forth. If this is not ensured, the creation of this market could backfire and lead to more violence than when we started. Thank you for these thoughtful comments. I agree that trust is essential for any market to work properly, and I also concur that the relationship between law and trust is a complex one … To the extent some (most?) vampires won’t play by the rules of a legal market, then we will still need vampire slayers!